Above: A picture taken March 20, 2004 in Vancouver of Darwin Bedford handing out anti-Bush leaflets warning fellow peace activists of America's Religious Right agenda. The world needs to take a big step back from itself and have a good laugh. The time for the paradigm shift regarding religion is now. Let's face it -- Jesus was only a man. 2000 years have gone by with bloody conflicts over what the truth was about him and what he had said. According to historians his story wasn't even original. Only son of a god! Ha! Ha! Sacrificed for forgiveness of our sins! Double ha ha! Yes people, it's wrong to let people continue to believe. Look what's happening in America today. We have the rich (some of whom are religious) protecting their wealth by supporting religious freaks in government (some of whom are rich) who are out to kill Muslims and steal their oil. We have created a monster government that doesn't want people to enjoy marijuana or marry who they want. They even want women who don't want a child to bare them anyway and it's all because of what it says in a book. Everything said in the context of God being real is mere nonsense -- including "the Bible is the word of God." So let's have some fun throwing it out. We need to write to our politicians. We need to convince them that Jesus has caused enough suffering in the world from parading around as a son of a god and from his general lying. We need national governments to commit to executing Jesus Christ should he ever return. Now you might not think that a campaign to kill a man that is already dead has any merit. However, it would show to the world that people do not fear retribution from gods. If enough people keep hounding the government to say that they will indeed kill Jesus should he return then eventually a grand feeling of relief will come over the world and the world will be able to concern itself with Earth being an everlasting paradise. "Everything said in the context of God being real is mere nonsense." It may appear that this is a hate site, but in fact, this is a love site. If Earth is to remain an everlasting paradise, then socially we need to denormalize religion because it is so harmful. Religion is harmful at every level, Religion harms individuals, families, communities, countries, and the world as a whole. Along with each religion comes acceptable customs, practices, and forbidden items and activities. Religion harms individuals by masking the truth. When an individual believes that there is a life after their death and that a God wants them to behave in a certain manner, they are no longer living a spiritually free life and they are burdened by false threats. There is also a chance that the individual may "misinterpret God's wishes" and kill or cause harm to themselves and/or others. Religion harms families by splitting them apart when members deviate from the family's standard faith. Religion harms communities when members of each faith collect in areas and then conflict with each other over how to share resources (for the benefit of their own religion's adherents). Religion causes contention between neighbouring countries when there are permissible activities or items in one country that are forbidden to the other country's faith. Religion harms the world generally in many ways. We need to direct our efforts towards reasonable goals. For instance, the time wasted praying could be spent learning how to minimize damage from natural disasters. I'm not advocating that we kill a real living person. Jesus is as make-belief as Kenny in South Park. It's ok for South Park to kill Kenny in many episodes, so it should be ok to suggest that we kill the fictional character, Jesus, a second time. So killing Jesus again is not a hate crime, it is a joke with attitude. According to the Gospel we are supposed to kill Jesus, it is said that God sent Him to us to die for our sins so that we may be forgiven for our sins and spend a blissful, everlasting afterlife serving and slaving away for Him. How can we be forgiven for our sins if we don't kill him? If you think my brain is fried, wait until you read it! 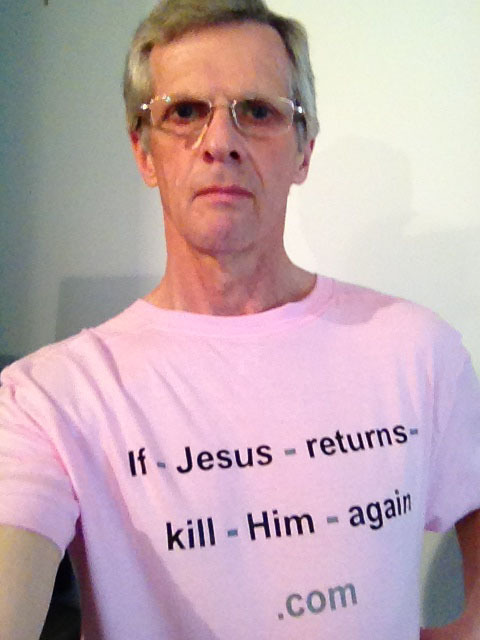 Will you please help me kill Jesus should He return? I'm thinking of forming an official society under the Societies Act for the purpose of killing Him should he return. And should God send us His only daughter in flesh instead (for the purpose of dying for forgiveness of sins) then we should kill Her too. We need to show God-fearing people that we have no fear of God the father and that we think the Gospel story plot is ridiculous. Imagine chapters of the society forming in every country of the world. Eventually it would lead to your tax dollars not going towards the spread of religion, but towards real education. Many people follow others instead of using reason to come to their own conclusions. In the face of so many people claiming to kill Jesus--should he return, these people will realize that fearing God is much like fearing the dark--there is nothing there! If you want to help me build a society (for killing Jesus) then please send me an email stating so. Please don't tell me that Jesus still loves me anyway--I already get enough email telling that. Perhaps His father loves me, but both the previous Pope and the current Pope have made a comments that perhaps God is sleeping. This has been fun writing, have a good day.